Now that we're settled into our new place, I got the chance to look through the latest issue of Cook's Illustrated. One of the recipes that caught my eye was this one for Broccoli Cheese Soup. We've been experiencing some rainy days lately so a bowl of this soup was perfect for lunch. It was creamy, a vibrant green and flavorful with a faint hint of heat. One thing you won't find in this particular recipe is a lot of heavy cream like traditional recipes. 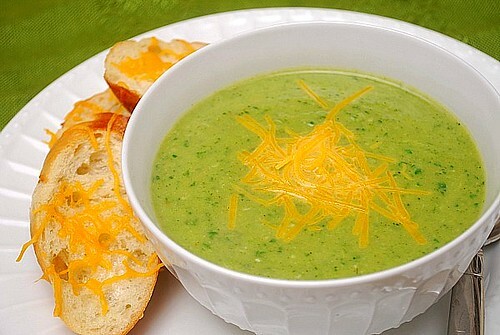 Instead, this version has everything you love about broccoli cheese soup, only healthier! For this soup, the first time I made it, I thought it was slightly bland. As a result, I added a little bit more garlic, some garlic and onion powder and changed up the cheeses. I definitely preferred my adapted recipe since it added some flavor it was missing initially. If you must, you could substitute frozen broccoli but I prefer fresh for the flavor and color. Even though the broccoli is cooked down, the baking soda called for in the recipe will help retain the green color. Should you use frozen broccoli, you may have to increase the amount of baking soda to prevent it from having the already processed broccoli turning a grayish color. I served this soup with some toasted slices of French bread, sprinkled with sharp cheddar cheese. Prepare the broccoli by cutting the florets cut into bite sized pieces. For the stalks, peel and also cut into bit sized pieces. This will make it faster to cook through and easier to blend later in the recipe. Melt the butter in a dutch oven over medium high heat. Add the broccoli, onion, garlic, garlic powder, onion powder, dry mustard, cayenne, and 1 teaspoon salt. Cook, stirring frequently, until the broccoli and onion are fragrant and slightly softene. Add 1 cup of water and baking soda, stir & cover to cook until the broccoli is very soft, about 15 to 18 minutes, stirring once while it cooks. Remove the cover and add the broth (or stock) and the remaining 2 cups of water; bring to a simmer. Add the spinach, and cook until wilted, about 1 minute, if not less. Using a stick or immersion blender, puree until smooth and bring to a light simmer. Season to taste with salt and pepper. Stir in the cheeses until melted through. To serve, ladle into bowls and garnish with additional cheddar. Love broccoli, never tried this combo, Thanks for thsi recipe! This looks great Joelen! I just bought a huge bag of broccoli at Costco, so I think this is what's for dinner tomorrow night. Looking forward to it!! I love soup! Definitely gonna have to try this one!